I thank you very much for having inserted me in a very distinguished panel to discuss the issue which is kept under cover in such a way which contradicts the only formula, the only medicine, the only strategy that exists in fighting terrorism. Well, I think we have to also today congratulate, at least, there is a light at the end of the tunnel. There is some positive, comforting and reassuring element in the behavior, in their line which was taken by some governments, by a number of people, by all of you, by the president-elect, Mrs. Rajavi, and the growing number of supporters of the National Council of Resistance of Iran (NCRI), a growing number of supporters that we can see in some European and some national parliaments in Europe and also in the European Parliament. And support is motivated and is shown by what has happened over the last few days. Last week there has been a very important decision by the German prosecutor to consider extradition to Belgium for Assadollah Assadi, who was in service, at the embassy in Austria and there was clearly a diplomatic immunity which was given to him just to led team operate, and re-enforce a network of the Iranian terrorists in Europe. So, they were very welcome news today, is the fact that the extradition was given, was deliberate. And as a follow up to that, the French government and also, to some extent from what I see in the British media, in the U.K. media, also the U.K. authorities, have finally brought up publicly this issue in clear terms, telling the fact to the readers. I was very positively impressed this morning by this huge coverage by Le Monde. but what is coming out publicly because of these investigations is also the way the Iranians have construct and developed, a network over the last many years, at least ten or fifteen years, in France. And this story concerning “le centre Al-Zahra, relay de l’influence du radical Iranien en France “. This story tells you that there are not only terrorist organizations which are in the field in Europe, but there is a network of self-presenting associations and cultural groups or political groups, human rights defenders or people who claim to be active for the peace in the world or the Mediterranean, or the dialog between Moslem communities, Islam and the other religions in Europe. They’re claiming that, but in reality, they are directly connected with Iran in organizing events, raising funds, promoting. Hezbollah, Islamic Jihad and promoting the most radical groups in the Islamic communities in Europe. And that is something that must be underlined with the public opinion with the media, and that is a role that the government should have to make public that there are these infiltrations in our political life and even in our culture of these associations which they are directly funded and organized by a foreign country with a clear purpose of destabilizing our societies and our countries. And this, I think, is a beginning perhaps. The exposure of the behavior that the Iranian leadership is having, and it might spread in other countries where we have a similar phenomenon. I’m not revealing any secret by saying there are similar organizations to Al-Zahra center also active in Italy, in Rome and in Cagliari. 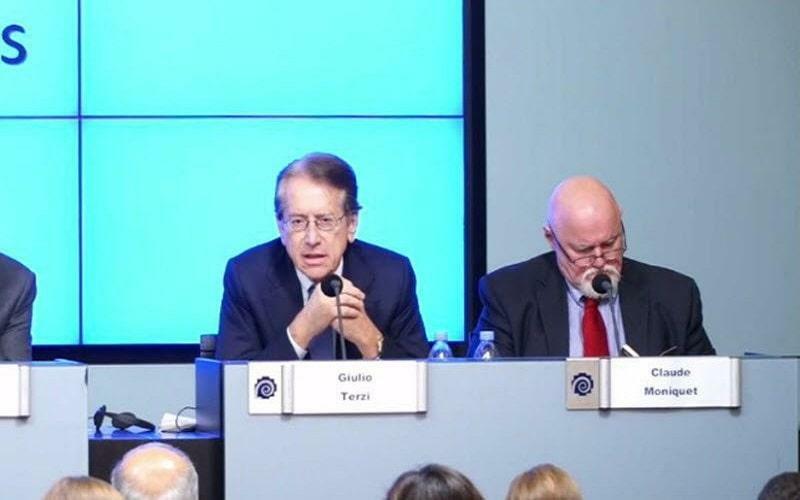 So, what I can agree on with Madam Rajavi is that there must be a more effective and determined, much more determination, by the European Union, both in terms of interpretation, narrative messages that we sent to the public and that we sent to the international community. And there is also a need of unity between the European Union and the United States. Because, is only with unity, and the situation is so heavy and so threatening for the European Security, the situation of the Iranian supported terrorism, is so heavy that we have to fight together, Europeans and Americans together, against these very heavy threads which affects the European security. Iran represents today a match bigger threat as a terrorist country than we thought the “Islamic States” was presenting for Europeans.